The conventional notion of a leader refers to the person in charge, the head of an endeavor, the boss, the captain, the person who tells others what to do. In this way of thinking, an act of leadership is something the leader does - primarily, command or decide. I don’t subscribe to the conventional notion. 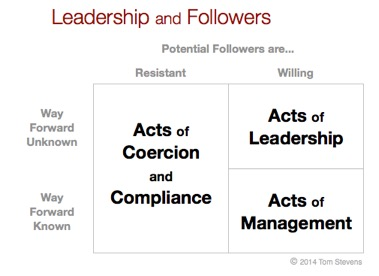 I think “acts of leadership” are ultimately determined by followers not leaders. Two conditions must be met for true leadership. First, those times when the way ahead is uncertain or unknown. Second, when people have a genuine choice whether or not to follow. The need for people to contribute their best as they take an endeavor into uncharted territory is the quintessential challenge for business and community organizations alike. Leadership matters. When circumstances are uncertain, and when it’s important to bring out the best effort in people, that’s when acts of leadership make a huge difference. Why? Because people make their best effort only when they voluntarily choose to do so. 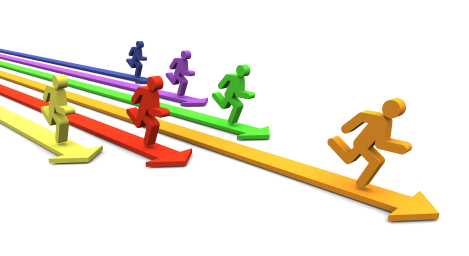 Leading is the art of giving people a genuine choice whether to follow, while making the choice to follow compelling. A true act of leading is determined not by the “leader” but by the people who choose to follow. When people “follow” because they are compelled to do so, they are simply complying or giving in to coercion. This may be necessary, even desirable at times, in order to move an endeavor forward. But it’s more an act of power than leadership. When people “follow” based on established procedures, structures, and relationships to accomplish established goals, then what we have are acts of management. People follow those in authority based on what French and Raven would call legitimate power. The use of power is interwoven into human endeavors, and power is something aspiring leaders need to understand and apply wisely. But what constitutes the highest form of leadership is grounded in empowerment - in people choosing to follow into the unclear future. Aspiration for power and aspiration for leadership are not the same thing. If you want your endeavor prepared for the unknown and where people contribute their best, then develop leadership. This article may be freely reprinted in your company, association, or publication (or website) under the following terms: that the author attribution, copyright notice, contact information, and this reprint notice be included; and that you inform us that you are using the article (samples appreciated). Contact Tom for a pdf version of the article.